Equator will be available as a firmware upgrade for existing Seaboard owners next month. 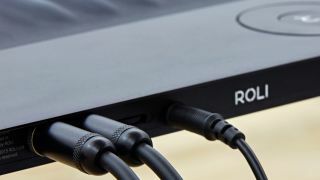 MUSIKMESSE 2015: ROLI, creator of the super-expressive Seaboard keyboard, has unveiled Equator, which it describes as a "cross-platform multidimensional synth engine". Equator promises an intuitive interface that makes "complex modulations easy to understand and control," with its presets covering everything from acoustic instruments to synthesized layered effects. Sounds can be loaded directly onto the Seaboard Grand - meaning that, for the first time, it can used without a computer - while Equator will also be available as a standalone Mac OS X application and a plugin. Roland Lamb, ROLI's founder and CEO, commented, "We're absolutely thrilled to be shipping groundbreaking software that unlocks the full expressive potential of the Seaboard. Equator is a delightful way to to shape sound, and paired with Seaboard Grand it takes multidimensional digital instruments to an entirely new level. This will introduce a seamless marriage of expressive software and hardware that will expand the creative potential for producers and performers alike." The software versions of Equator will be available from 27 April, and it will ship as an onboard instrument for Seaboard Grand from 18 May 2015. Existing Seaboard owners will be able to obtain it as a free firmware upgrade. Find out more on the ROLI website.